Evogrip. 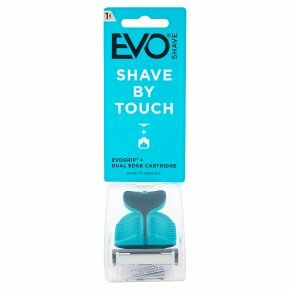 Shave your touch.Welcome to the Shave Revolution. Ideally during or after a hot shower, get your face and neck ready with your gel or cream of choice. The sensation of Shave By Touch will feel new and unusual at first so relax. Simply rest your fingertip on the cartridge for maximum control and let them bend and flex intuitively over the contours of your face as you shave down your face. Then flick up to shave if you want and even closer experience. Once done, rinse any left over gel or cream with cold water and admire your new look. Warning: Razors and blades should be kept out of the reach of children.